Love this photo, so proud of our young author!! nice vest denali !!! Go K !!!!!!!!!!!!!!!! This is a really cool pic. I just received a copy of the book and I can not wait to dive into it. This is wicked holiday fun! Hope you get a great present! Wow! I love, love, love this picture of your mother. She’s so pretty like you are. And how cool that she’s holding up your awesome masterpieces so proudly! This pic totally rocks! Kya Rocks! Santa is so good at spreading fear. Always watching folks then breaking in to their houses. What a psycho. But seriously a perfect X’mas gift would be a Kya Aliana novel. Santa’s gone to the dark side! That’ll make for a scary Christmas. Holiday* Oops, I was shaking so badly that I couldn’t even type correctly! I can’t argue with Santa! Even Santa likes a good scare from Kya Aliana! Santa is thinking of getting freaky! What a great Santa pic!! Love these books!! Better listen to Santa or he will put you on the naughty list!!! Kya Aliana is a name I’m sure you’re going to be seeing a lot! Great pic with Satan! Well Santa is an anagram for Ol’ Mr. Scratch, ya know. Alright! Way to go, Santa! Even he likes to read Kya Aliana’s books. I know that author, a brilliant up and comer. Read more Kya.. Great picture. Nice picture with Santa Claws (lol)! Great taste, Santa! Two must-read books from a talented young master of suspense and horror :-). Kya is fantastic! Santa? Or Jack Skellington in a VERY good disguise? More holiday fear? Why are we not funding this?! 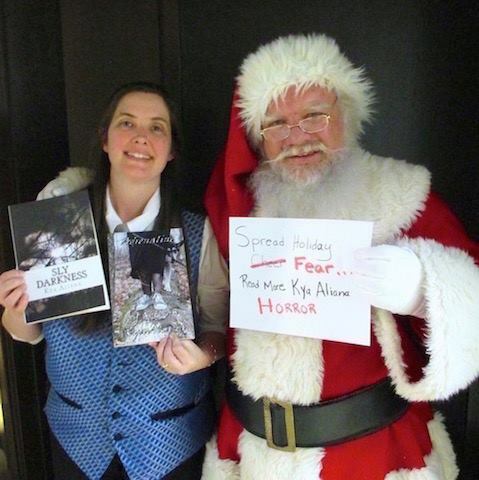 SANTA GETS HIS HORROR FIX!! super creepy santa!¡ go K.A! WE’RE YOUR BIGGEST FANS. best of luck! Nice selfie. Where’s Santa’s Elfie? I’m sure there’s a empty bag down by “Santa’s ” feet – unseen out of the pic. This has to be The Sacky Man in disguise – ready to take the children away – for the holidays. I like the Sacky Man. . . beautiful pic! I’m 72, today. And my granddaughter Kya Aliana scares the hell outta me too, Santa!!!! I believe in Santa Claus !! Ho ho OMG GET IT OFF ME. Awesome shot, I luv it! Yule is every bit as scary a season as Samhain. Great selfie. Note that the red suit hides blood stains. Fantastic pic! Kya’s work is Ho-Ho-Horrific, and I do mean that in the best possible way! I look forward to many more additions to this very talented young author’s list of titles. Love this! It makes Santa seem a little creepy, tho 🙂 Miss you guys! I cant wait to get the Book i won in a contest signed by Kya herself!!!!!!! Awesome photo! !!!! Happy horrifying xmas cheer! Wow, you got SANTA to help! That’s awesome! very cool pic !! Go K !! Great picture! Love the combo of fear and the holidays! Perfect! Here’s to a great Christmas! I hear you’ll see the author live and in person, special! Good to see santa supporting horror. Santa’s down with the dark! Love it!! Haha, nice photo. Hmm, bad Santa, good books. Is this part of the Horror for Tots program? I need to get Madison one of your books!!!!!! See even Santa love Kya’s books! LOVE this! Holiday fear, so cute! Wow! Even Santa likes Kya Aliana’s book! Great pic! Santa, bring me this for Christmas!!! I’m thrilled to be working with Kya. She’s very talented!